With one possible exception, I don’t believe in making New Year’s resolutions. If something in our life needs fixing, why wait until January 1? But I’m a huge believer in the power of our small, everyday choices: Every thought and action moves us either closer to our best selves — or farther away. In that spirit, I present the 2015 version of what has now become an HBlog tradition. I wish you and yours a happy, healthy year ahead … and may our good wolves win. Wolf illustration based on original photo by Growling Wolf. Text adapted from multiple sources, including First People. Love this story! Every time I read it… Couldn’t agree more! Thank you, Samira! My humble typography doesn’t hold a candle to your gorgeous letterforms — but the message still comes through, right? 🙂 May 2015 bring you much happiness and success. That is a message to live with, to bring with us wherever we go. I wish you and your husband such a beautiful 2015 that you can’t even put it into a post. 🙂 Muchos besos y abrazos y una buena salud sin complicaciones. Muac! Now that is a beautiful message we should all carry inside. I really mean it. If you are scared, angry, you hate your body, you hate your parents/partner, or constantly try to adjust to other’s projections of yourself, then it is impossible to overcome the obstacles of life without being permanently damaged. We are ultimately responsible for what occurs to us. Our responses and actions only lead to an accurate reaction. Being happy is a state of mind, a feeling you have inside of you, and it is impossible to achieve it through material means. You have to accept who you are, and project that on the others. Thank you very much for your thought-provoking comment, johnberk. 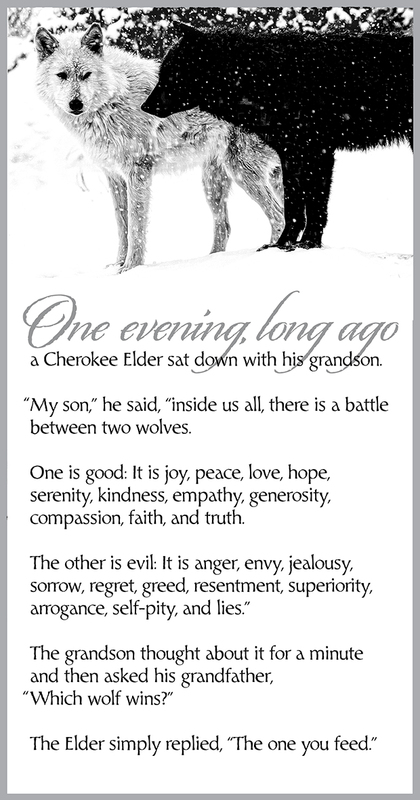 Although we sometimes can’t control (or even prevent) what happens to us, we can always control how we respond to it — and *that* is important to remember as we consider which wolf to feed. I wish you much happiness and good health in 2015. As myself i don’t believe in making new years resolution. Thank you for an amazing read. I try my best; even in those times where you want to flip out, to feed the good wolf; To be a better me. Whenever I want to flip out I try to ask myself, “Will this matter in five years?” The answer is rarely “yes,” so I move on to other things. It doesn’t work 100% of the time — but it’s a good way to at least try to get a sense of proportion. Thank you for stopping by! Not really about art. But great inspiration for some artwork. I was so happy to see this posting as I have the same exact view on New Year’s resolutions!! Thank you!! Great minds think alike, eh? 🙂 Well … happy New Year to you! May it bring you good health and every happiness.